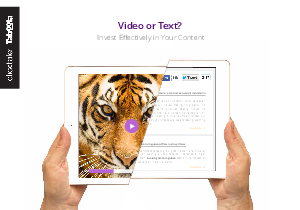 Video has been crowned as the new, catchy way to present your content. But producing videos is complicated, expensive and time consuming. Text can still be an effective medium under the right circumstances and it is much easier and cheaper to produce. You want to make sure that you’re spending your resources wisely and getting the highest ROI. So how can you choose correctly? What impacts people’s preference to consume data via video or text? What works better for your brand? Will a visitor reading an article prefer to continue reading or change to watch a video? Fill in the form to download the free research paper!